In this video clip, my sister Peggy and I demonstrate the crazy ways we came up with last-minute creations for our kids to wear on Halloween and how fun they were to throw together. As usual, our television talk show hosts were somewhat speechless (that happened a lot!) when we’d shove coat hangers into tights and smear our faces with Karo syrup and coffee grounds. The important lesson here is when we become more organized we set the stage to create. We become creatives! Clutter gets in the way of our creativity. Decluttering and ending your "stuff management" days will pave the way to fun, creativity, new adventures and excitement on Halloween as well as all the days of the year! CBS had asked us to bring 10 crises Halloween costumes and they split our appearance into two segments that particular day. Watch the second segment next Thursday if you liked these ideas I came up with. Also, please share the video with your friends who have young kids. 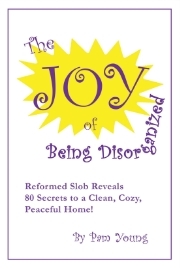 In "The Joy of Being Disorganized," Chapter Seven is titled, There Arose Such a Clutter. I want you to have that chapter free, because I know that getting rid of clutter will accelerate your creativity. The House Fairy is the brainchild of New York Times bestselling author Pam Young. A stay-at-home mom of three, stepmother of two and grandmother of 12, Pam has enjoyed most of her life surrounded by happy children of all ages. With a major in drama (not in college, but in life) Pam has always been able to see with the eyes of a child. Writing a shelf of “self-help” books to inspire disorganized moms, Pam’s focus has always been on solutions to the challenges mothers have in life.